Lord Hanuman is one of the most revered god in hindu mythology! 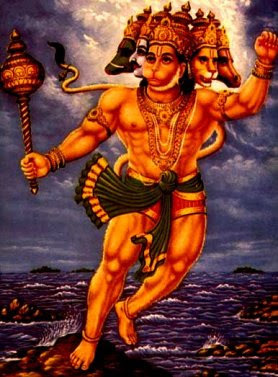 Lord Hanuman is not only the most powerful but also the most humble gods in the hindu pantheon. As you'd readily notice, it is extremely difficult to be "most powerful" and "most humble" because a powerful individual (taking humans for example) develops vain pride (arrogance) and is no longer humble. On the other hand, humility is seen as a sign of weakness. One has to develop a significantly superior spiritual outlook to be both powerful and humble! Further, truly understanding Lord Hanuman is also truly understanding Human Psyche and how to be successful at everything you do! 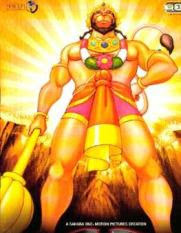 Lord Hanuman as a kid - Hanuman was not your normal godly gods as a child. 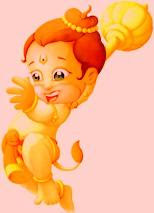 Instead Hanuman is not ed to be remarkably naughty as a child! It might come as a surprise but pulling saints/sages beards, dousing sacred fires, drinking offered water and in general pestering peaceful saints in very "ungodly" ways were just some of the things Hanuman used to do a kid!! As you can see, Hanuman was very different and unpredictable when compared to others. To add to it, he had superior powers to even begin with so that they just couldn't shut him in some room to keep him away! This is also related to the fact that Lord Hanuman is Rudravtar! Rudra-avatar means an incarnation of Lord Shiva's rudra aspect (rudra means angry). Now you see one of source of kid Lord Hanuman's personality. So how Hanuman is the most poweful god of all the Hindu pantheon - It's a long story but to summarize - Hanuman as naughty as he was a child, thought that the rising Sun was some kind of fruit and flew away to grab it! Since no one could stop him, the king of gods, Indra had to hit Hanuman with Vajra to stop him. 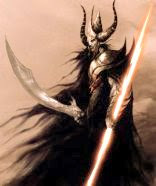 Remember that Vajra is Indra's most powerful weapon and Hauman, as strong as he was to begin with, became unconscious. Soon, all the gods were reprimanded for this and all gods gave part of their powers to Hanuman back! This is what made Hanuman the strongest being in the universe and also made Hanuman one of the eleven Chiranjivis (Immortals)! But why Hanuman is unable to use his powers - Following, the aforementioned events, gods realized that now Hanuman is stronger than even all the gods put together and if he stays on his old ways then no one knew what might happen!! Yeah, we are talking about a kid more powerful than anyone in the universe loose! So, a sage decided to "curse" Hanuman to the effect that Hanuman was forbidden the use of his own powers until someone reminds him to use them! In other words, Hanuman was cursed so as He no longer could remember his powers that he had residing inside him, and Hanuman's extremely powerful abilities effectively became dormant! Jamawant reminded Hanuman of His powers in Ramayana - So Hanuman's powers stayed dormant for a big part of His life till they were needed by Lord Rama. Yes, you can see that everything has a reason in Hindu mythology; even giving a naughty disastrous child the powers of universe had a reason! In this case, the main reason to give Lord Hanuman those powers was to help Lord Rama! So, Jamawant reminded Hanuman of His powers and whooooaaaa.....Lord Hanuman became bigger than biggest mountains, flew over oceans, slew millions of demons, leveled cities with his mighty tail, uprooted and carried whole mountains on his back and what not! Lord Hanuman once deafeated even the demon Ravana who had subdued Death herself!! But Human stayed humble - Yes, this is a really important part of the mythology here! 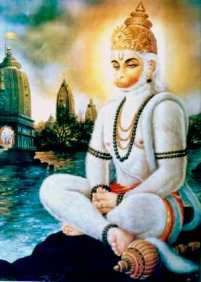 Lord Hanuman served Lord Rama as a humble servant even after all of his powers were revealed. In the terms of powers, Lord Hanuman is not too different from Lord Rama but the core differ ence is that Lord Hanuman acts as a humble servant and Lord Rama acts as a master but in the essence they are both one and the same! This is in accordance with Lord Krishna's message in Geeta that after a point both devoted and devotee become one and the same. This is what is called Nirvana. So what can we learn from Lord Hanuman in real life - If we remove all the mythical powers and curses business, we see that Hanuman gained confidence and was able to realize his powers when someone told him that he could. But this applies to everyone! Even regular mortals like us!! We all have "powers" to do what is necessary and good for us and those around us but those "powers" that we always have remain dormant until someone tells us that we can! This gives us confidence! This is different from the motivation that says "we must". This is the motivation that says that "we can" and not "we must"! The "we can" thing helps us become at ease and gain the necessary confidence to do what we "must". Now thinking of this such deep and important meaning of the simple tale of Lord Hanuman, I'm just wondering if this simple mythical tale of Hanuman is just a fanciful fable or is it also trying to convey the fundamental laws of human psyche and the theory of motivation? Is it trying to convey things much more meaningful than a "monkey god and his fancy powers"!! To find how Shiva consumed eternal poison and how christianity originated from Hinduism, click - Did Christianity originate from the story of Shiva and Halahal? i love this web site and how such complicated topics are explained with such simplicity! Thanks.